This is the fourth report of a series of the integrated household surveys conducted by the National Statistical Office. Through the Integrated Household Program, the NSO conducts Integrated Household Surveys every five years. The first such survey was conducted in 1990 and was referred to as the Household Expenditure and Small Scale Economic Activities (HESSEA). This was followed by the 1997/8 Integrated Household Survey which is commonly referred as IHS1. The second was conducted in 2004/5 and is referred as IHS2. The current survey was conducted over the period March 2010 to March 2011 and is being referred to as IHS3. 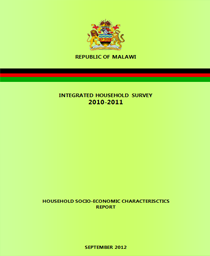 The main objective of the Integrated Household Surveys is to provide and update information on various aspects of welfare and socio-economic status of the population of Malawi and are presented at various levels such as national; urban-rural; region and districts as well as disaggregated by gender.